This summer’s World Cup promises to be a spectacle as a host of the best players in world football come together to represent their various countries. Every four years, the football world is held spell-bound with amazing matches of the World Cup, and this year’s edition in Russia is no exception. English giants, Manchester United will have a lot of representation at this edition, as a host of the club’s players are full and well-established internationals. With United not currently performing to optimum level, a number of these players will be primed up to give their best at this tournament as it comes only once in 4 years. Here are three United players who can set Russia a light. On his day, there are perhaps no better central midfielders than Paul Pogba. On his day, there are perhaps no better central midfielders than 25-year-old France International, Paul Pogba. The diminutive midfielder combines pace, power technicality and brilliance on the ball, and will be one to watch out for this summer. His season at Old Trafford has been beset by injury and form complaints, but at his best, he is a handful for any opposition team in the world. In the French national team, he is one of the go-to men for Didier Deschamps, the manager. 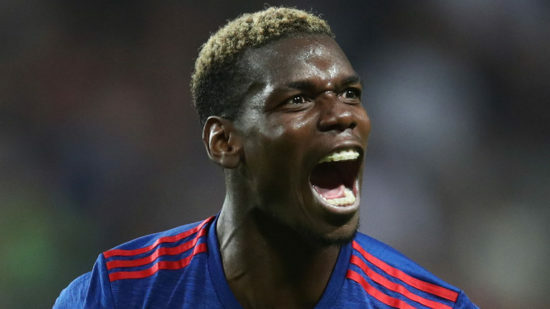 Les Blues are one of the favourites for the trophy, and central to anything good they do will be Paul Pogba. He looks a better player when playing for his national team. In the injury-enforced absence of German shotstopper, Manchester United goalkeeper, David De Gea has become undoubtedly the best at his trade in his department. The Spanish number 1 is enjoying a fantastic individual campaign at United, earning plaudits for his remarkable goalkeeping week-in, week-out. He is expected to keep goal for Spain at this summer’s World Cup, as he has become the undisputed number 1. De Gea is primed to have a brilliant mundial, as his calm, reflexes, and shotstopping ability are unrivalled in world football at the moment. He will be head of the goalkeeping department for the 2010 champions alongside the likes of Sergio Rico and Kepa Arrizabalaga. Belgian international, Romelu Lukaku has been in fantastic form in the last few weeks, scoring goals and creating goals for teammates in equal measure. The former Everton man will lead the line for the Belgian national team this summer. Four years ago, he was a young and raw striker only known for his physicality, though in the years since that, he has worked on other aspects of his game. Belgium have a fantastic crop of players, of which this might be their last chance at achieving success on international stage after the disappointments of the 2014 World Cup and The European Championships of 2016. Lukaku is the Belgian national team’s all time top scorer, though he is still just 24. Manchester United can still end the season well by finishing 2nd and winning the FA Cup, but for these players, winning the World Cup will put them into a select group of individuals to have won football’s Holy Grail.